I have loved my Kindle and enjoyed watching the eBook reader category grow over time. Cost has always been a barrier, though, so I was very pleased to see the new Amazon Kindle at $139 joining the Sony Reader Pocket Edition and Barnes & Noble Nook Wi-Fi with a price under $150. This low-cost third-generation of the Kindle has Wi-Fi, and there is also a $189 version with both 3G cellular and Wi-Fi. Amazon improved upon the second-generation Kindle with a higher contrast e-ink display, more than double the storage (3,500 books), three weeks between charges with Wi-Fi on and a slightly smaller and lighter body—measuring 7.5 x 4.8 x .34 inches and weighing in at 8.5 ounces (less than half the weight of an Apple iPad). So will you miss the ubiquitous connectivity that 3G provides? Increasingly the answer will be no. On the road you’ll be able to use AT&T Wi-Fi hotspots for free, which can be found in many Starbucks, among other places. Plus, more cell phones, like the HTC EVO 4G and Motorola Droid X, are starting to include the ability to create personal Wi-Fi hotspots. Also available is a matching case ($60) with a built-in booklight, for reading the Kindle in bed without waking your spouse. 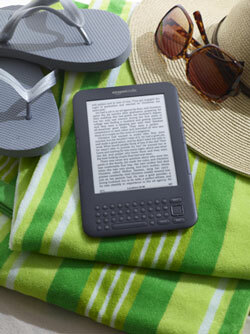 The bottom line is that dedicated eBook readers with e-ink technology still provide the best reading experience. I’m glad to see the Kindle, my favorite eBook reader, become more affordable. I think that the future of Amazon’s digital books is going to be on your phone, which is always with you. I don’t see the point of buying the Kindle now. For many I’m sure that will be true. I actually do most of my Kindle book reading on my iPhone, but I still prefer the reading experience on my Kindle device, especially when I read for more than an hour or outside. Amazons Kindle has competition from Mypadmedia. It is the latest app available to Ipad owners. One of the most popular things Ipad owners do is download reading material to their Ipad such as Books, Comics, and Newspapers.Once you have the Mypadmedia service installed on your Ipad for one time fee of $49.95 you can download hundreds of types of books, bestsellers, classics, mystery, thrillers, crime, and romance.No download costs, no other fees to pay.